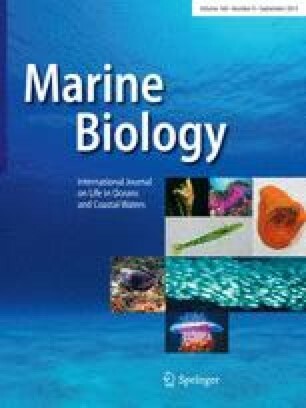 The interaction of a suite of predators with mating and spawning chokka squid (Loligo vulgaris reynaudii) was studied at inshore (<50 m) spawning grounds off South Africa. This study provides the first detailed records of predator–prey interactions of squids on their spawning grounds and is the first attempt to time disruptions caused by predators to the egg-laying behaviour of squids, thereby quantifying the perceived threat to the prey. The squids are focused on mate choice and reproduction while they aggregate over egg beds and they may be more vulnerable to predation than at other times. Their vulnerability to different predators in the field is examined and the tactics used against different predatory species are illustrated using recordings made with underwater video cameras. Predators recorded included two cephalopods (Octopus vulgaris and L. v. reynaudii), five teleosts (Pagellus bellotii natalensis, Spondyliosoma emarginatum, Pachymetopon aeneum, Cheimerius nufar and Pomatomus saltatrix), seven chondrichthyians (Squalus megalops, Mustelus mustelus, Carcharias taurus, Dasyatis brevicaudata, Gymnura natalensis, Poroderma africanum and P. pantherinum) and three marine mammals (Arctocephalus puscillus, Tursiops aduncus and Delphinus delphis). Analysis of behavioural interactions between predators and prey showed that predator disruption of egg laying may be quantified in terms of time. Marine mammals caused the most acute disruption, whereas other taxa had more chronic disruption effects because they spent more time on the spawning grounds. During November 1995, the suite of predators changed during the course of a 2-day period of underwater video recording, possibly because of an increase in water temperature. The hypothesis that predators would be concentrated around a spawning aggregation was tested by surveying the spawning ground using an underwater camera towed by a boat navigating with differential GPS. The results supported the hypothesis because predators were located only around the spawning sites. The serial spawning of chokka squids in recently upwelled water may reduce predation pressure. Furthermore, it may be difficult for predators to predict the specific spawning site on a particular day because squids disperse away from egg beds at night and use numerous spawning sites along the coast.